Sonny's first son here, Steve. This was my father's first store, following his management of his father's store, Kaplan's, and prior to moving onto Main St. near Five Points. ""First in Style, First in Quality". If I'm not mistaken, Mr Galifinakus (senior) had an eatery on the street under that tailor shop, where my father mentioned he was surprised to take a bite out of his hotdog, only to find an eyeball staring back at him... Which wouldn't surprise anyone who knew him. 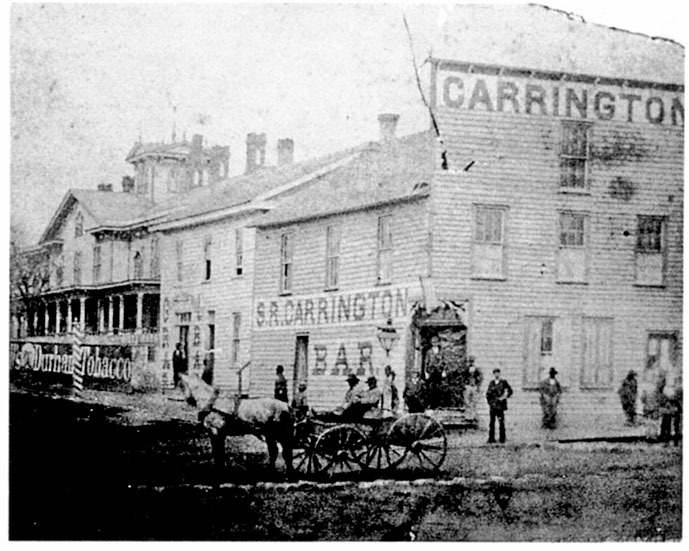 The Carrington bar, located at the northwest corner of S. Mangum and Peabody (now Ramseur), was one of these early establishments. This picture, from the 1880s, looking northwest, shows the Hotel Claiborn in the background. By 1902, the Women's Christian Temperance Union had succeeded in prodding the city to pass prohibition, and the saloons were no more. Below, Same view of the former Carrington Bar, looking a bit worse for wear, with the Durham Silk Hoisery Mill in the background, likely early 1920s. 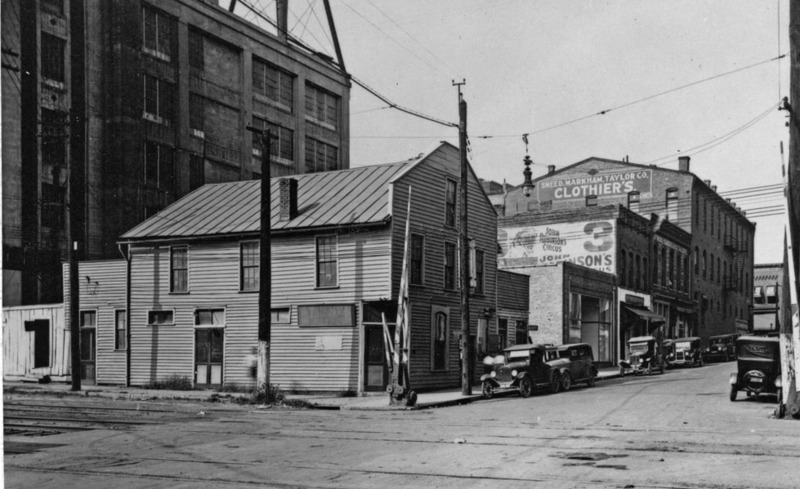 Note how close these structures were to the railroad tracks - Peabody St. did run sporadically between the tracks and buildings north of the tracks, but it was no more than a small-ish two-lane street. 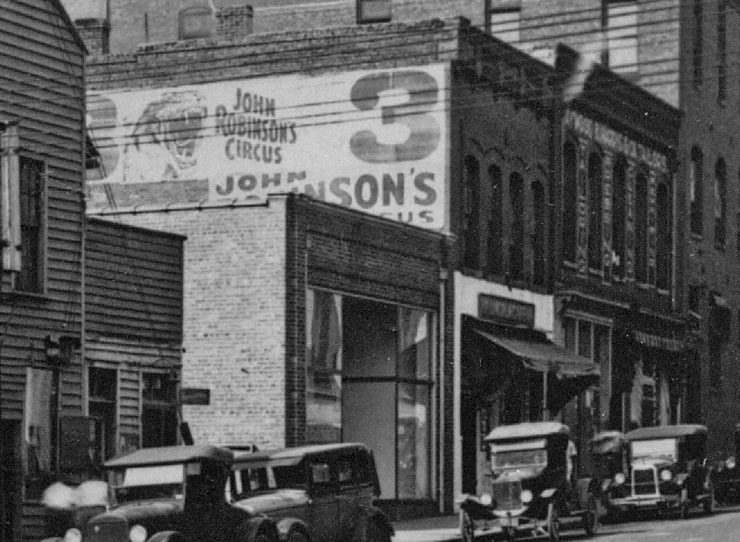 By the later 1920s, the old bar had been renovated, and we see the other commercial structures between the bar and Main St., including the back of the Sneed-Markham-Taylor building, profiled yesterday. And I felt the need to blow up this shot more to show two things: one, the awesome snake, and two, the 2-story commercial structure at the right, just behind the SMT building. The writing surrounding the windows on the second floor looks oddly like hieroglyphics to me from this angle - but I can make out "Tailoring". 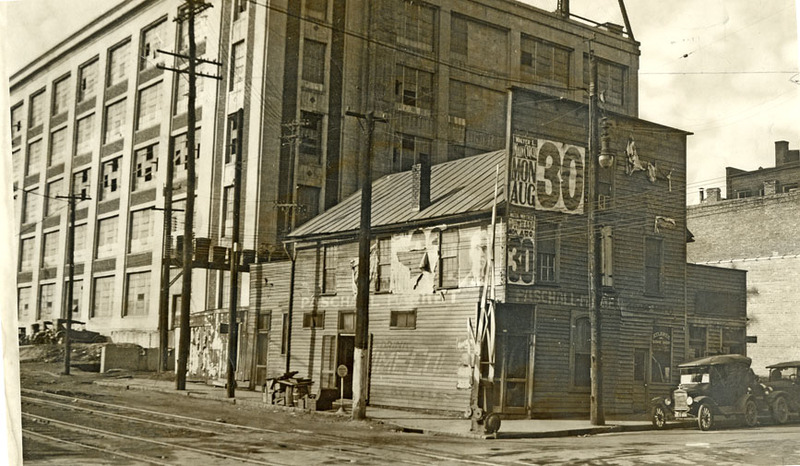 The building at 120 South Mangum was likely built around 1930-1935. In later years, it was the Hayes and Sons Market. Sonny's shoe and clothing store took up 1/2 a bay of 120 S. Mangum and all of 118 S. Mangum. Below, the other buildings to the south of the Lincoln Cafe. The Silk Hosiery Mills Building looms behind them. Looking northwest from Peabody (now Ramseur), 1963. Circa 1960s match book cover. The empty 120 S. Mangum, late 1960s. 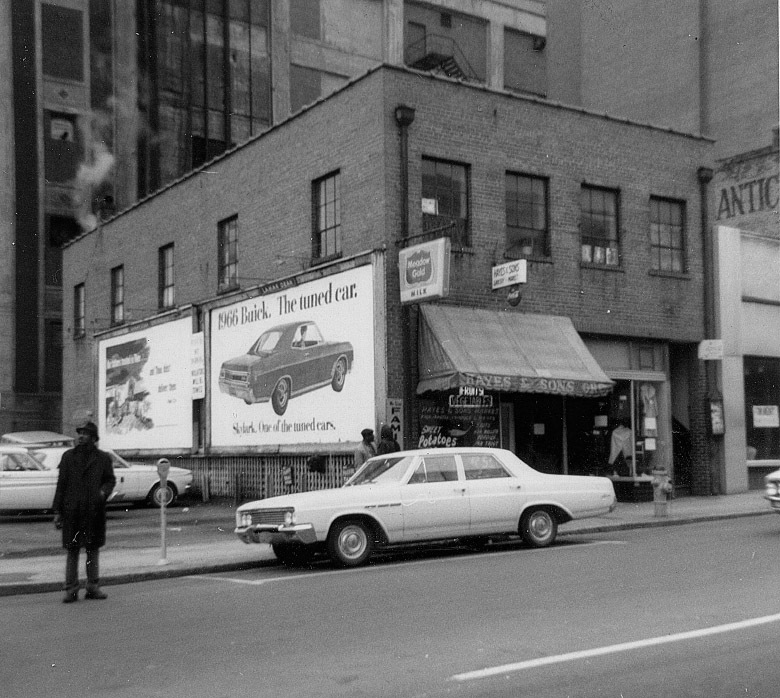 These buildings were taken by Urban Renewal and demolished for the Loop and surface parking.